Gamification, while new and potentially expensive to integrate at its highest levels, is a trend that is growing quickly and has already gained traction in the L&D sphere. Gamification involves applying the typical elements of game play, such as point scoring, competition and achievements, to development programmes. At its core, gamification taps into the basic human desires for status and achievement, and it uses those desires to create motivation for staff members to access and engage with development opportunities and resources. 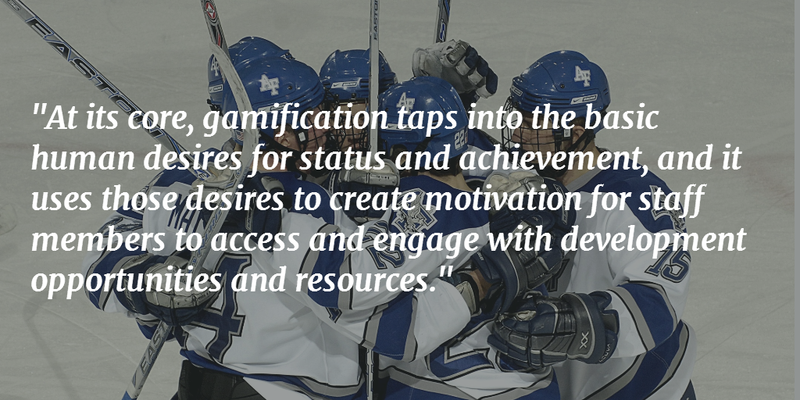 So how big is Gamification really? Estimates show that the industry is set to grow from $1.7 billion in 2015 to $5.5 billion in 2018 (1); it has quickly become an established industry that can boast engagement at all levels of business. Indeed, statistics show that 61% of surveyed CEOs, CFOs and other senior executives take daily game breaks at work, half of whom report that doing so makes them feel more productive (2). The allure of gaming as a means of development centres in its ability to engage in a world where engagement statistics are abysmal, and where development and knowledge capital are at a premium. So how can we implement without a huge budget? If you think gamification is just about paying developers huge sums of money to create custom games that focus on your organisation’s policies, procedures, systems and compliance, then you can’t see the trees for the forest. There are numerous elements that can be integrated into your existing programs for minimal effort and cost, boosting engagement and offering your staff a competitive edge to their development. In many highly successful games, what makes them so enjoyable is a backstory. Our hero has a reason for the quest they are undergoing and the hardships they are enduring. From big name games to smaller titles, heroes undergo quests and fight bad guys for reasons which are known to the player. In the same way, Learning and Development programs need to invest in a backstory. Your hero is the trainee, give them a backstory as to why they are there, give them meaning for their development journey and a purpose for the experience and knowledge they are going to achieve by completing their Learning Quests. This backstory can be as factually plain or as embellished with elements of fun and fantasy as your L&D team sees fit, but remember, there is a reason why people are engaged by games that come with a purpose for why they are investing their time and effort. 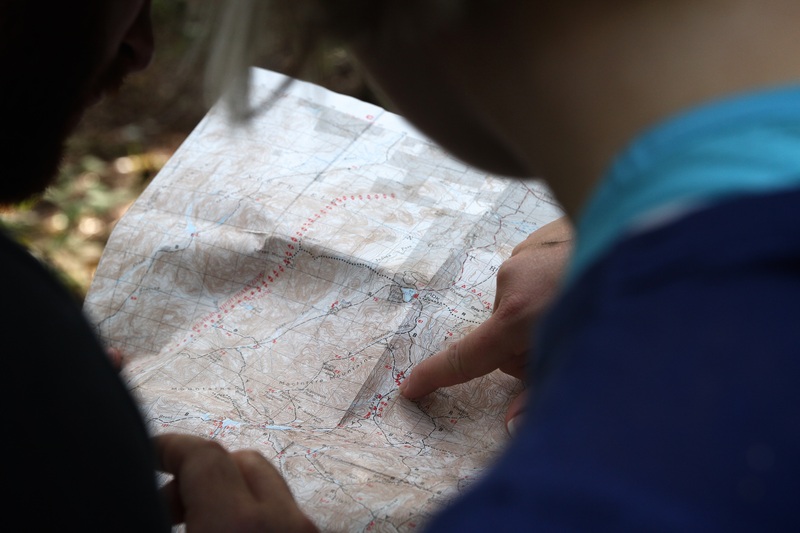 Give them a map, let them know where you’re heading, and let them find their way to achieving their development goals. 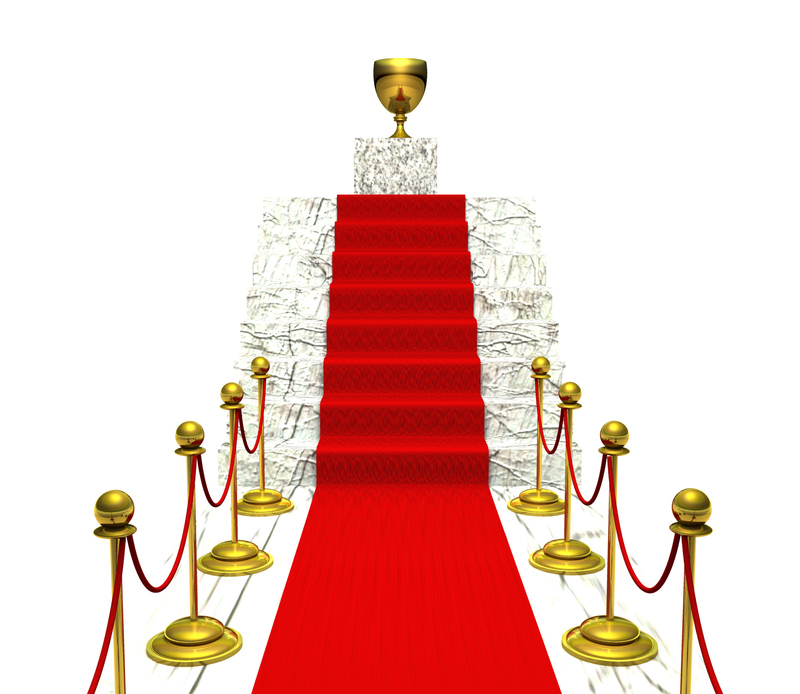 One of the strongest motivators for humans is status and recognition. If you bundle these desires into your learning programmes, then, engagement-wise, the sky is the limit for your organisation. E-Learning is particularly able to be aligned with these specific elements of gamification, but participation in Social Learning, Webinars and Face to Face courses can also be applied. For each element of learning successfully completed, a staff-member achieves points which lead to rankings. These points can then be accrued, allowing the staff member to ‘level up’ to a higher pre-defined rank or level of mastery determined by the L&D team. Some competitive industries also implement a Leaderboard where staff are encouraged to try and get to the top through rewards. 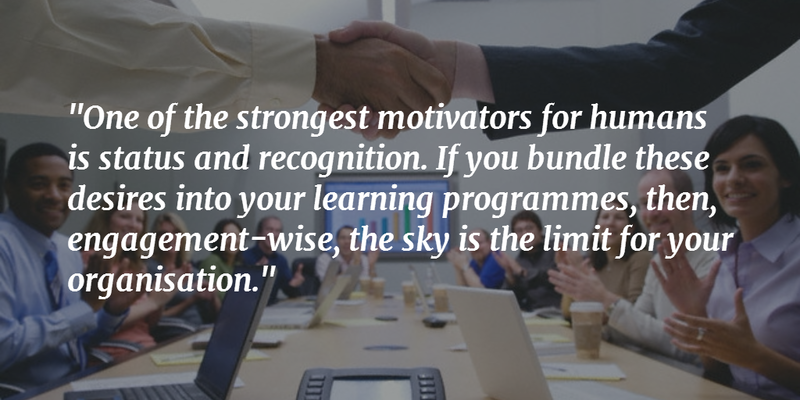 A Leaderboard which resets after a given time can be utilised to ensure a level playing field, which maintains interest in the ‘game’ for those new to departments or divisions, and encourages long-term employees to keep developing themselves. Resetting the Leaderboard can also work well in an environment where compliance training is a key factor in L&D programs. Rewards have always been heralded as a great way to engage and motivate staff, and it is certainly true that, with games, one of the key incentives to keep playing is achieving rewards such as better materials, tools or coins. If you are utilising Leaderboards and Levelling Up or even if you aren’t, there is no better way to motivate than with rewards. Whether the reward is a certificate of completion, recognition through performance management, a prize, or a monetary incentive, there is no better way to add a layer of competition than to provide a reward for effort expended, for levelling up or for achieving the number one spot in the Leaderboard. Just remember for those on a tight budget, rewards do not have to cost the earth; sometimes the best reward is public recognition of achievements, which can be announced verbally, via email, in staff publications, or on bulletin boards. When staff are encouraged to take regular training or, by law, must remain current in their skills through specific compliance training, then the concept of Loss Aversion can be utilised as an extra measure of engagement and encouragement. If a Leaderboard or Levelling Up is utilised, then loss aversion is easy to implement. Instead of rewarding new points, points for training courses can expire if currency is not maintained. In this way, staff have both the carrot and the stick approach, and fear of losing points and risking rankings can make staff more eager to ensure they maintain their ‘Level’ of mastery. There is nothing better to grow confidence than utilising practice activities and simulation in training sessions. So how do we gamify these activities? One way is by gamifying Social Learning, which encourages staff to work together, sharing each individual’s different skills, knowledge and experience, to achieve work-based goals. How do we gamify this experience? Central elements of gaming are sharing knowledge, and collecting and trading items. If each trainee is given a backstory, a purpose and skills or items that reflect work based simulations, the activity can then involve finding others with information or skills that can assist them to achieve their simulated purpose, and then collecting or trading their skills and information to achieve their goals. You can even implement game rules that will help you to further broaden the achievements of the simulated activity, allowing trainees to practice valuable soft skills in communication, working together, asking the right questions to achieve required information, or even relationship selling by making part of the game an effort to encourage as many other players as possible to utilise the skills and items they were assigned. 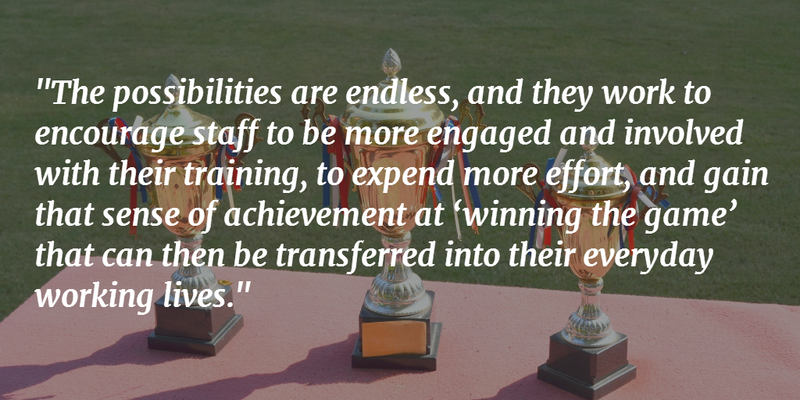 The possibilities are endless, and they work to encourage staff to be more engaged and involved with their training, to expend more effort, and gain that sense of achievement at ‘winning the game’ that can then be transferred into their everyday working lives. The possibilities for gamifying L&D are endless, and they don’t have to cost the earth. All they really need is the will to implement and a little bit of imagination on the part of the course designer. The statistics are clear, no matter how they were taught, whether via E-learning, face to face or blended, learners who participated in gamified simulations achieved 14% higher in skill-based knowledge assessments, 11% higher in terms of factual knowledge and had a 9% increase in retention rates (3). 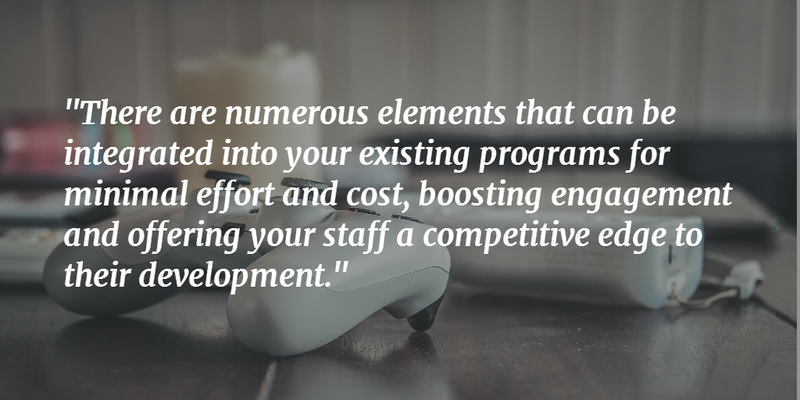 With these kinds of successes, it’s time to get on board with gamification and unlock not only your staff’s potential, but engage them in the pursuit of their own development. This entry was posted in Training Theory and tagged blended learning, e-Learning, employee, employee training, games, gamification, gamify, learning, learning and development, statistics, team training, training, training and development. Bookmark the permalink.